The Famous Warehouse on Granville Street is among many restaurants on that street but all of the food on its menu is $4.95! That's probably cheaper than a fast food restaurant meal a few doors down. The night we went, it was pretty crowded and the restaurant is small so we had to wait outside for a bit. The manager was attentive and came out to talk to us to pass the time. He made sure to let us know that we will be seated as soon as possible. There are TVs behind the bar and in the corners of the restaurant making it a great place to watch sports with friends. The seats and tables are wooden benches placed closely together which adds to the sports spectators ambiance to cheer for a team together. I liked how the dish is still presented nicely despite the inexpensive price. 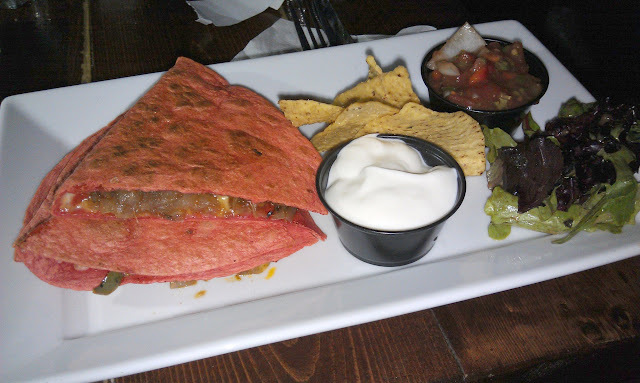 I ordered a Vegetable Quesadila which came with some greens, tortilla chips, sour cream and salsa. Although the quesadilla wasn't as good as the one I had here it was still tasty and hot. Overall, whenever I am in the area I will keep this restaurant in mind for a quick, affordable bite!